A wardrobe is one of the key pieces of furniture within any bedroom, and we have chosen a range of wardrobes that offer style, a choice of materials, various size options, but most of all, they offer fantastic value for money! This collection of wardrobes is ever growing, and we offer a selection from Bentley Designs, Rauch, Julian Bowen and many more. Please note, some items require light assembly. Whilst we are mostly known for providing top quality products for our customers in the bed and mattress industries, our passion for interior design has given us the opportunity to branch out into different areas in recent years. We've used our experience to ensure that everything we sell is manufactured by the best brands in order to guarantee quality. 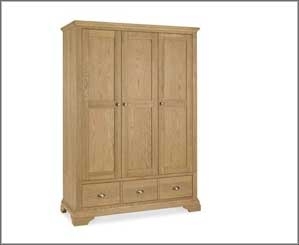 Wardrobes are a classic furniture item that can be found in nearly every home across the country. Despite the wardrobes time-honoured appeal, we recognise that no two people have the same taste. This is why we've carefully selected this collection to showcase different shades, colours, styles, sizes and shapes.